Help ODOT make a better Oregon Coast Bike Route. Great way for us to help make the OCBR safer and more enjoyable. Giving a heads up to the 2 larger bike shops on the route, Bike Newport, and the one here in Astoria.. I would wager that many people spend more that $500 on that route. I know I probably did. I don't know what they could do to improve safety on the route that has not already been done without some very expensive infrastructure improvements. If I had to pick one it would likely be the tunnels. Though what do you do there? Dig a bike tunnel? I suppose you could stop traffic while bikes are in the tunnel and on the approach to the tunnel but I can see how big that would go over with drivers. A slightly less expensive improvement would be to put in shoulders where there are none. The only part of the route that I thought would have been truly uncomfortable to ride was the section I did not ride. That is between Crescent City and Klamath (yeah I know really CA). I ended up taking a shuttle and am so glad I did. The road is very steep and very narrow. A bike lane or wider shoulders and call it a day. There really just isn’t a big need for more. I’d strongly vote against moving it off of 101(what’s the point if you’re not riding the road along the ocean?) and making a low speed shared road(a lose-lose for bikes and cars as far as I’m concerned. Speaking from experience, I think all of the low speed, speed bump filled roads around Portland are obnoxious whether riding or driving). Making a specific bike lane or wider shoulders(basically the same thing) would make the most sense. It completely solves the sketchy traffic problem and I’d think would be the easiest and cheapest solution. A shared bike and walking path would probably be OK as long as it wasn’t used too heavily by walkers. If it ended up being popular for walking, that would ruin it for biking. Who wants to spend the day riding 3mph weaving through people walking along with no regard for others, probably three people wide taking up the entire path(which is what Will happen without question if it’s popular for walking tourists)? Sounds like a pretty good way to ruin a beautiful coastal ride to me. I’d rather ride the current road. Keep it cheap and simple as possible. If there’s money left in the budget toss it into the state parks and use it to improve hike/bike camp sites or include washing facilities at the campgrounds. That would be pretty rad to be able to get to the park earlier and spend more time enjoying the parks rather than spending an hour and a half sitting in a laundromat in the middle of the day. Not all of 101 is on the ocean, The parts that are not could be detoured if roads are available or they want to build bike paths. and your views might even be impoved. My one suggestion was to build a bike path (if environmental rules will allow ) past the dunes which is not visible from the road. But I agree don't sacrifice ocean view to detour the route. There is more that can be done. My suggestion was strictly enforce speed through the tunnels when bike warning light is on. Perhaps put in cameras and periodically post troopers. I got coaled by a pickup going through a tunnel. Had there been a camera the event could have been caught. Another quirky idea I had was to provide or get people to volunteer operating as ferry in place of crossing a bridge. I came up with the idea at Irondequoit inlet near Albany. The bridge is permanently swung open in the summer forcing you to go all the way around the bay. I instead contacted the marina for a water taxi. They had none but loved the idea of us crossing there and said they would help. They sent a local boat owner to take us across. It added a very cool twist to the trip. There is is easy and straight forward. Not sure if it would be as easy at the various crossings to the route. but perhaps not as frequently as convenient for most.. It uses the 2 bikes on the front of the bus, rack, which may already be full..
so communicating with the bus , maybe meeting it in town, loading your bike, there..
rather than the foot of the bridge turnoff is needed. Until the bridge was completed , in 1966, there was a ferry.. then it was un needed..
Cathlamet to Puget Island WA, a short bridge , ferry from the Island to Westport OR runs hourly.. Buses all along the route with amble bike racks would be helpful. Not that route, but I've been working on finding ways to make it up the McKenzie Highway without being on the McKenzie Highway. I've gotten it so that I can avoid about 80% of the main highway. It would be a little further if just a little work was put into making it more convenient. For example, there are several roads that come within 1 mile of each other, but don't connect for one reason or another, and one major bridge was de-decked. Paving logging roads? I had looked at the coast route a while ago, and there are a few places where one can easily bump off of the main highway, and get 5 or 10 miles on back roads (adding some distance to the route). Perhaps good signs and marking them, such as put a curvy green lane around corners. Unfortunately a lot of the route is still on the main highway. How much work would it be to cut bike lanes around the bad spots? I know there are a lot of steep cliffs, but say cut a 5 foot (rather narrow) path into the cliff face, with good guard rails. It could be quite spectacular. I'd much rather see a 5 foot trail created than widen HWY 101 by 5 feet to add narrow shoulders. The cost might not be that different (of course, a bike trail only marginally helps vehicles). No doubt a 400 mile bike path would be very expensive. However, it could well be heavily used. It wouldn't, however, be a bike path, but used by dogs, joggers, beach access, interstate hikers, etc. When will they really start working on the Salmonberry Trail? As far as bridges, I wonder how easy/expensive/safe/etc... one could build cable crossings. It could add to the adventure, but I could imagine they could be wild picking up the coastal winds, and would have to be built to withstand the coastal salt. Hmmm.... Thinking more about ferries. There are some places that would be quite natural for a ferry. How are the waves? For example in Tillamook, a short ferry ride across the west side of the bay, and one could stay off of the main highway from the bay down to Pacific City, about 30+ miles. Could one get enough bicyclists, pedestrians, fishermen, etc to support a micro ferry during the summer? Say a 30 foot boat just shuttling a few people at a time back and forth? Keep the costs low, $2 per person, $6 per family? Fill the boat with a half dozen people for a 10 minute ride. North Bend / Coos Bay / Bandon might have a similar configuration that would benefit from short ferry hop. It looks like one could do something similar in Washington, say in North Bay and Willapa bay, although wider there, without feeding as much secondary road. Maybe see if the Coast Guard or the Navy had a suitable boat to donate. Or, a fishing boat buy-back program? Docks could be pretty simple. Augment it with shore based solar and wind power? Water current power? SAIL? I was thinking it could sort of be catch as catch can sort of things. Get volunteers to do it. If they are there, you get the shuttle. Otherwise you take the bridge. Marinas have maintenance boats that could be used as ferries. . They might be interested in lending a hand. Not sure how that would shake out for a liability. Sounds like I will be dead before it is built. 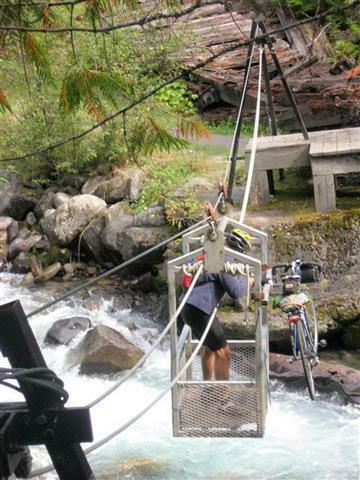 I've seen a (steel) cable powered river crossing , cable lays on the bottom of the stream . until it is called on to pull the boat, perhaps the the winch on the shore. Last edited by fietsbob; 12-10-18 at 03:37 PM. I've seen a cable powered river crossing , cable lays on the bottom of the stream . I was imagining cable crossings as @spinnaker had found. But, for a coastal route, one has to deal with navigable rivers and harbors, and low elevations, so the both hanging and drag cables for boats could be problematic. I think the Willamette River ferries may be electric powered, but again, hanging or underwater power lines could be problematic. I think it will happen, but they have to deal with a couple of river crossings. Oregon has come up with the new bicycle tax, and I hope the Salmonberry trail gets some of the money from that tax. Was it "matching money"? There's a 7 mile long railroad causeway across Lake Champlain, converted to a cool bike path. One bridge had been removed, so there's a bike ferry in the middle. The path is a popular route near Burlington VT. It's a large, covered pontoon boat. The ferry is operated by a bike advocacy group! The ride is only 200 feet long, from dock to dock. $8 round trip, $5 one way. Their site says the fares only cover half the approx $150,000 yearly cost. That's for just 100 days in the summer and fall. 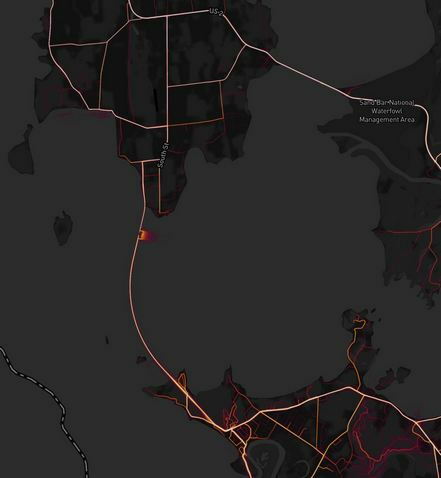 Here it is on the Strava Heat Map of cyclist ride recordings. You can see the various paths the ferry boat takes across the gap. Last edited by rm -rf; 12-10-18 at 02:04 PM. I think we have slightly different views of the ferry idea. I haven't ridden the coastal road much. 30 or so miles around Florence. I did the Florence/Siuslaw bridge, and maybe another one. I don't remember the bridge being a particularly bad experience. It is one of the places I might have taken the sidewalk. I was riding light, no heavy panniers, trailer, etc. I would like to see the government put in more effort to improving cycling access to bridge sidewalks (access points, looping bike paths under the bridge for single side access, widening them, better access around pillars, perhaps railings, etc). Anyway, I doubt a ferry would be viable running right under a main bridge. although being in the middle of a town might help. What is the Astoria Columbia bridge like? That might be an exception, and may well be one I would target for a ferry under the bridge. The places I was imagining using ferries would be 5 miles or so off of the main road, and saving a significant amount of HWY 101 riding. If I was riding the route, I would only turn off the main highway if I was 100% certain the ferry would be there. And, one would likely have troubles getting volunteers to shuttle bicycles say 150 days a year, every year. Always ready to snag a bicycle should one show up. So, I would think there would be a benefit of making a much more formal arrangement. Perhaps access road cameras, call buttons, cell phone reservations/appointments, etc. But, bicycles alone couldn't support the ferries. Just not enough of them willing to pay the rates that would be necessary. But, if one opened it up to bicycles, pedestrians, harbor crabbing, harbor fishing, local restaurants, local parks, hotels/motels, through camping, etc. One may well be able to support the ferries. If one could convince the state that each ferry would be equivalent to making 30 miles of bike paths, then the state may well have a vested interest in making it a viable option (land, infrastructure, tax credits, government surplus property, etc). Hmm... Would vegetarians object to fishing being a secondary purpose of the boats, and perhaps having some live crabs onboard? That crossing is up on the Galena Trail in New Denver. Not awful far for you. Lot of nice riding up that way. Doubtful it would fly in the states with liability and all. Since the topic has drifted afar.. I can see a bunch of rides that need to be flagged for "Ride not done on a Bicycle". Was the section of bridge removed to promote shipping traffic? Drawbridge? So, the tracks were mostly laid on a rock base. Interesting thoughts about costs. 14,000 passengers in a year. Whew!!! And still having troubles getting costs and income to match. I'm having troubles imaging that many bicycles & passengers. I think it would really have to be part of a pretty strong urban area. Hmmm... 100 passengers a day for 140 days. It is hard for me to imagine state budgets and transportation. I'd love to see a paved MUP trail along the ocean from Vancouver Canada down to San Diego. 1000 miles at say $500K per mile, and one is quickly up to a half billion dollars. And, still a few bridges and river crossings to deal with. Nonetheless, that would only be a drop in the bucket compared to what the state wants to spend on building a single bridge in Portland. My experience with cycling along the Katy Trail in Missouri was that there were a lot of cyclists around the big, and even medium sized cities, but they dwindled quickly as one got 20 or 30 miles out. 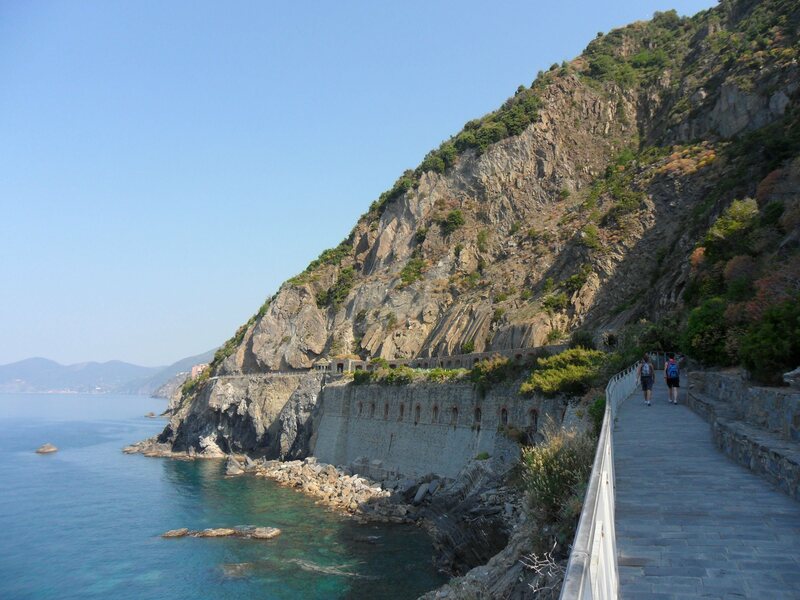 Building a strong tourist trail along the coast, likely would bring more people. I can't hardly imagine HWY 101 as a "family trail" for cycling. Yet a well thought out trail would likely bring 10x the current interest in riding the coastal route. Perhaps even more. Add some good park and ride spots along the way, and gateway towns like Florence would get quite a few bicycles and pedestrians, at least for the first few miles along the trail. Until one hits real hills? Maybe plan for wide trails in the cities, and significantly narrower trails in the hillier regions out of town. I could imagine trails cut into the sides of mountains. Yet, the Pacific weather may also mean that more sheltered sections of trail might be preferred to always being out in the open. Still, my experience with simple MUPS around town is that they must be designed for cycling. We've got a few curvy sections with poor visibility that can be dangerous to ride to fast. Perhaps next summer I'll have to try the rebuilt Columbia trail. Where is this? lower photo looks like Lago di Garda in north east Ital but I don't think there are bike trails along the shore and upper photo certainly is not Garda, so I am guess that is not it.